After finishing the Theresynth I thought of a way it could be significantly improved. 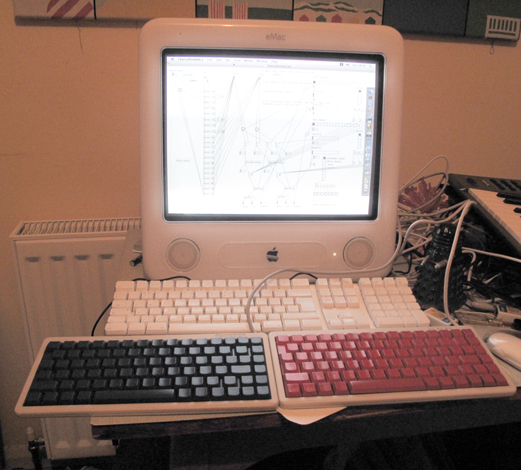 A little while before, I had experimented with alternative methods of inputting QWERTY keyboard information to the computer, by removing the circuit board and attaching different kinds of switches (See ‘A New Use for USB Keyboards‘). I reasoned that the same might apply to gamepads/game controllers: as long as the USB chip inside was still attached to the USB output, it would still be recognised by Pure Data, no matter what kind of switches were used to control it. 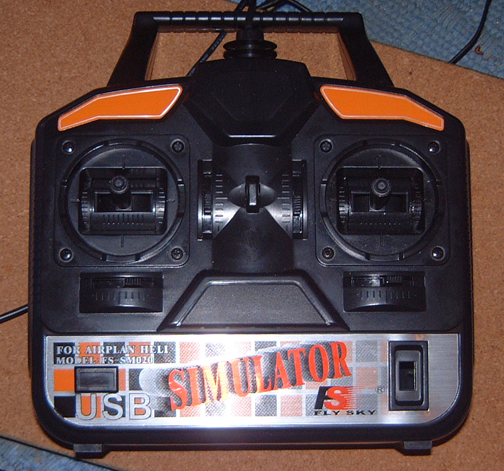 In order to test this theory I bought another game controller of the same type as the Theresynth (A ‘PCLine Rumble Game Pad’), took it to pieces and threw away the buttons it came with, leaving just the joysticks and the USB cable attached to the circuit board. Just as I had done with the dismantled QWERTY keyboard, I scratched away the surfaces of the tracks where a couple of the switch connections had been, soldered wires to the board and push-button momentary switches to the wires. I plugged the board into the computer via its USB cable and opened the Theresynth patch in Pure Data. I followed the steps to set it up, as I described in the Theresynth post, and, sure enough, Pure Data recognised it, just as if it was the game controller, rather than a circuit board hanging off the end of a USB cable; when I pressed the test buttons I had soldered onto the board, the ‘hid’ object recognised them just the same as the buttons on the original gamepad. Confident that I could operate the Theresynth with any type of enclosure for the circuit board, I considered how I could rehouse it. 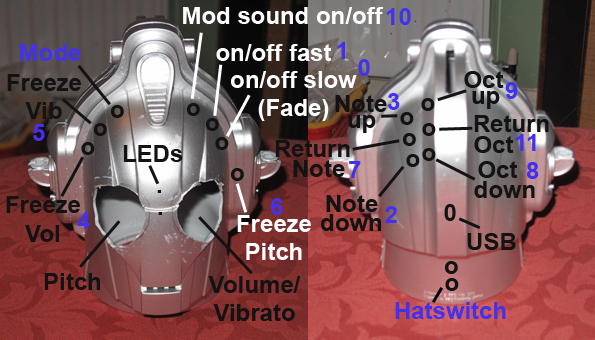 An obvious thought struck me: I had recently bought a plastic Cyberman head (if you aren’t a fan of Dr Who, they have their own page in the Wikipedia at http://en.wikipedia.org/wiki/Cyberman) for about 50p from a local charity shop, and it was clear that the eyes were spaced apart almost exactly the same as the distance between the joysticks. This was a clear sign of what I should do next. 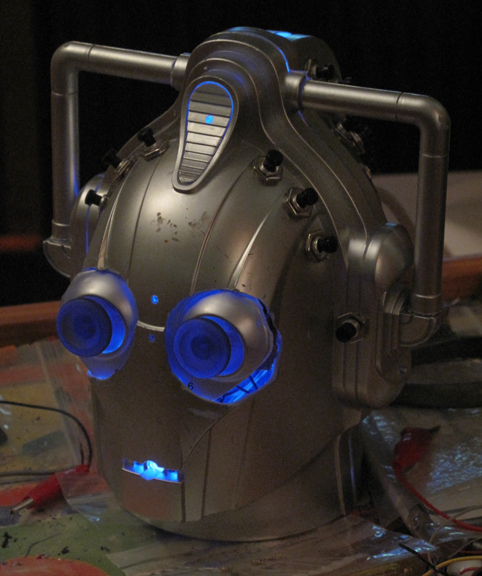 In short, I transplanted the gamepad circuit board into the Cyberman head, with the joysticks in the eye sockets and 12 or 14 buttons round the outside in a vaguely ergonomic layout. A chance visit to a Poundshop during the course of construction produced a nice USB-powered chain of blue LEDs, and I glued these at stategic points on the inside, producing an eerie glow when the instrument was plugged in. Another spare USB Type A socket from one of my broken Apple keyboards took the place of the hard-wired output lead, and the Cybersynth was ready for action. 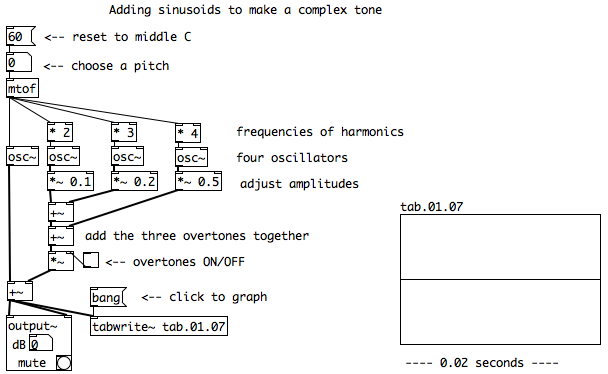 I took the opportunity to make some improvements to the Theresynth patch in Pure Data, adding, amongst other things, a facility to change the starting note from A to any other suitable pitch. 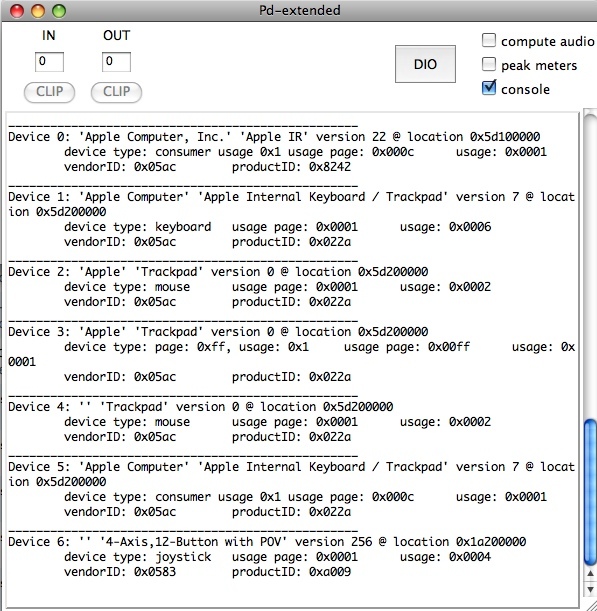 I automated some of the device number/control checks at the beginning, and the switching on of Pure Data’s audio. I never figured out quite what to do with the former hatswitch controls. In the end I stuck the switches on the back of the neck and used them for a sort of trill effect – the top button raises the pitch by a 5th when pressed, the bottom one lowers it by a similar amount. I recently blogged about using a gamepad as a drum controller (https://andymurkin.wordpress.com/2012/01/09/drums-with-multicontrol-v0-4/), and this was my next project using a Human Interface Device (HID). HIDs are the devices we use all the time to interact with computers. Keyboards, mice, trackpads, trackballs, joysticks, gamepads/joypads/game controllers and graphics tablets are all HIDs, and all can be turned to musical use with the aid of a suitable program to interpret their output. I chose to start with projects using game controllers because they have a fair number of buttons – and often joysticks – and are designed to fit comfortably in the hand (or hands). The gamepad I used for the drum controller had just buttons, but the one I used for the Theresynth had two thumb-operated joysticks. I planned to use one of these for controlling the pitch of an instrument. 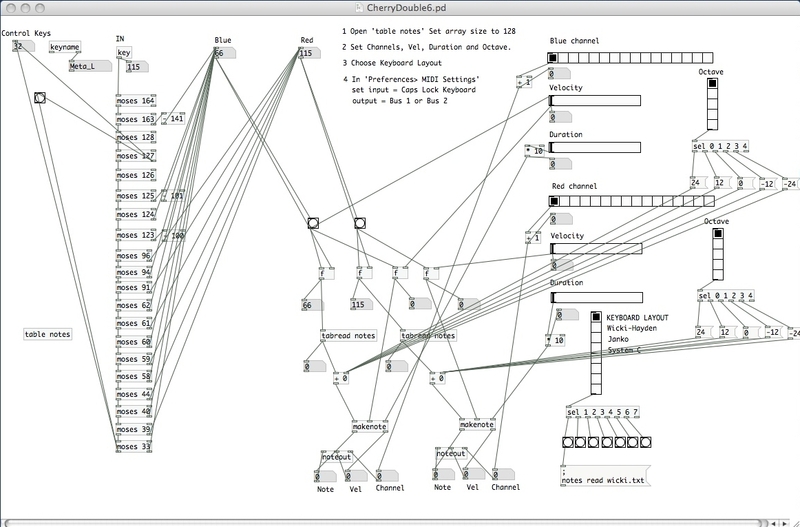 In addition, although I had used the pre-made MAX/MSP app ‘MultiControl’ for the drum controller, I planned to use Pure Data and do my own programming. 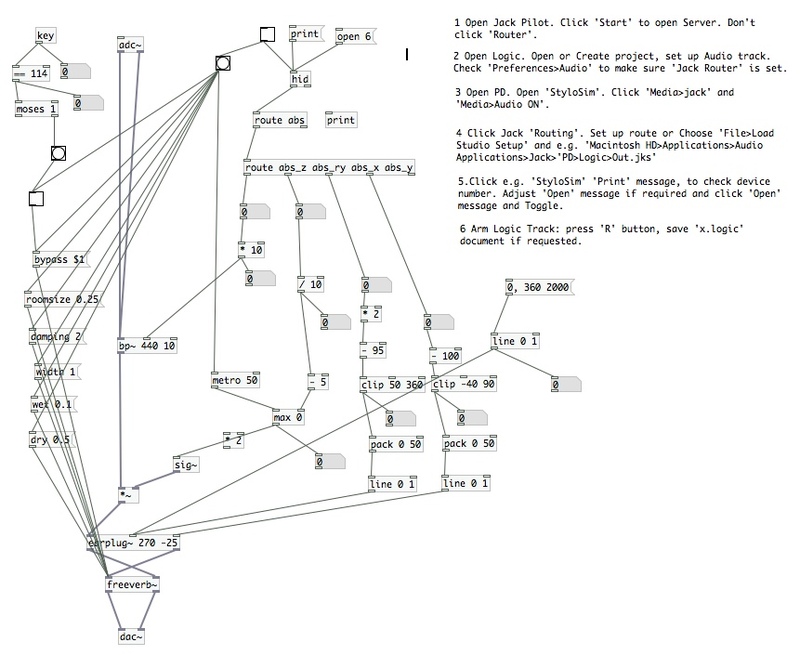 This was not as reckless at it seems, as programming in Pure Data is done graphically. 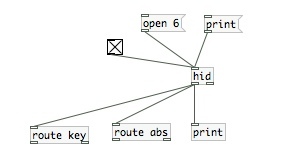 Many mathematical and audio functions are pre-programmed for you: all you have to do is draw boxes, write in them what function you want performed, and join the boxes together in sequences. Easier said than done, as I discovered, but easier, I thought, than writing lines of code. 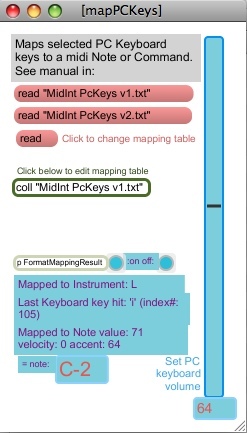 I have described progamming in Pure Data in my post about creating alternative musical keyboards, using QWERTY keyboards (https://andymurkin.wordpress.com/2012/01/01/alternative-keyboards-4/). 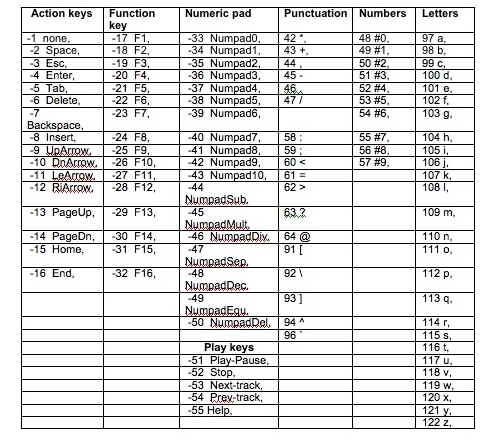 There, ‘key’ was the main Pure Data function used, as this is designed to receive key presses from the QWERTY keyboard; in the application I’m about to describe the special function ‘hid’ was the key to interpreting the output from the game controller. There are many Pure Data instructional videos on YouTube, and this one in particular: www.youtube.com/watch?v=HB_oVny33wA deals with ‘hid’ and game controllers. If you’re working on a project like this one, the first thing to do is to allow ‘hid’ to get Pure Data to recognise the game controller. To do this, plug in the game controller, run Pd-Extended.app, open ‘New’ from the ‘File’ menu and write (or draw, rather) the following into the empty box ‘Untitled-1’. Each connected device has been given a number. The first six, ‘Device 0’ to ‘Device 5’ are simply the different elements of my MacBook, keyboard, trackpad, and so on; but the seventh one, Device 6, looks like the important one: ‘4-Axis, 12-Button with POV’, ‘device type: joystick’. 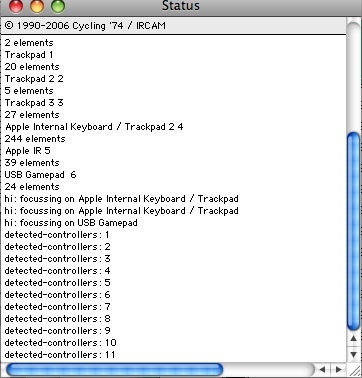 Sometimes it will tell you the make and model; in my case, my ‘PC Line Rumble Game Pad’ is identified only by its ‘vendor ID’, 0x0583, and its’ product ID’: 0xa009. We need to know the Device number, as we’ll use that in the program. 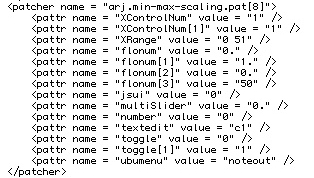 It doesn’t always come up as Device 6, so I always include in my Pure data programs a facility to check this number, and amend it if required. ‘Open 6’ is another message box. The small square on the left-hand side is an on/off ‘toggle’ switch, which I won’t be using now, but I’ll use it in a minute. 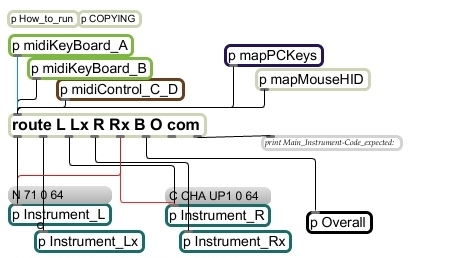 This shows 12 buttons, (‘btn_0’ to ‘btn_11’), the up-and-down and left-to-right axes of the left-hand joystick (‘abs_x’ and ‘abs_y’), the up-and-down and left-to-right axes of the right-hand joystick (‘abs_rz’ and ‘abs_ry’) and a hatswitch. Now you know this, you can separate each of the inputs as they come out of ‘hid’ and get them to do various things – make noises (as I did with the gamepad MIDI drum controller), control effects (like filters, for example), and so on. 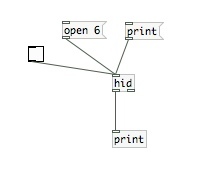 Other Pure Data objects (boxes like ‘hid’ and ‘print’) can do mathematical transformations along the way. While I was testing this out just now I did two extra things, which you can see in the screenshot above: firstly I added the small box at the bottom, which is called a ‘bang’. If everything’s working properly, this will flash on and off when I press the button ‘btn_0’ – which is very likely marked ‘Button 1’ on the game controller – and secondly I clicked the on/off switch (the cross means ‘on’) so that ‘hid’ would recognise and output button presses and joystick movements. Because the MIDI note number and control system lends itself easily to mathematical manipulation, this would be a common way to use Pure Data. In this particular application, however, I decided to use some of its many audio functions. 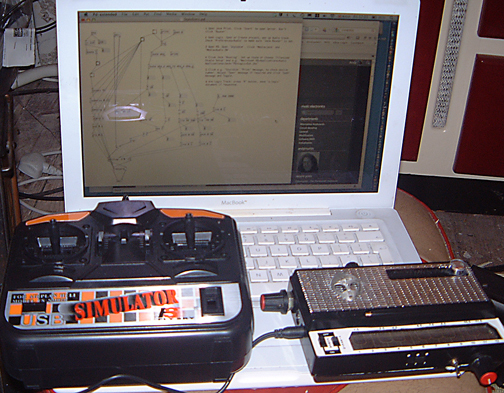 I’d spent some time modifying stylophones, as you may have read in previous posts. The thing about stylophones is getting great sounds from them is easy, but getting sinewaves out of them is well-nigh impossible. In Pure Data, however, it is extremely easy, so I decided to create an instrument which would produce ethereal sinewave sounds, rather like the Theremin. The Theremin is a wonderful electronic musical instrument, which you play without touching it! If you don’t know what it is, you can read about it on the Wikipedia at http://en.wikipedia.org/wiki/Theremin. 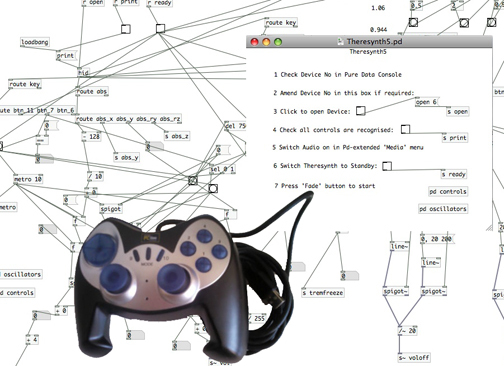 My plan for the ‘Theresynth’ was less ambitious, but would involve using one of the game controller joysticks (the left one) to control pitch and the other (the right one) to control volume. In the event, I also added a kind of vibrato (more of a fast auto-pan), controlled by the other axis of the right-hand joystick. This added a little more depth and interest to the sound. As well as this, a programming error I made along the way also enabled me to add a second tone to the instrument, which was a kind of frequency modulation/ring modulation – very effective in the lower register. The output from the the joysticks is in the form of numbers from 0 to 255. 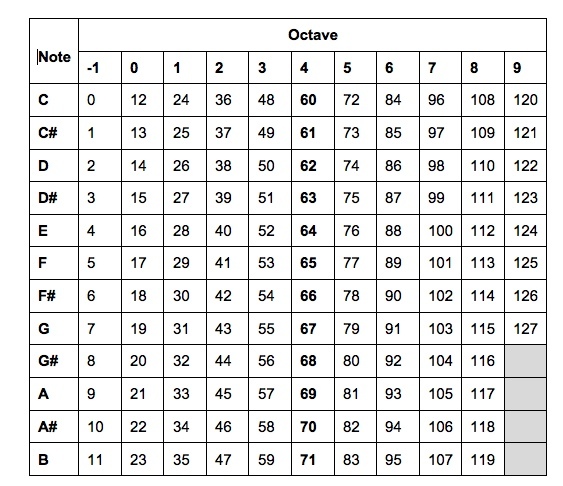 Divide this in half and you get all the MIDI note numbers (they run from 0 – 127); convert the MIDI numbers to frequencies and use this as the input to an oscillator, feed the oscillator into an output amplifier and you have a simple musical instrument! 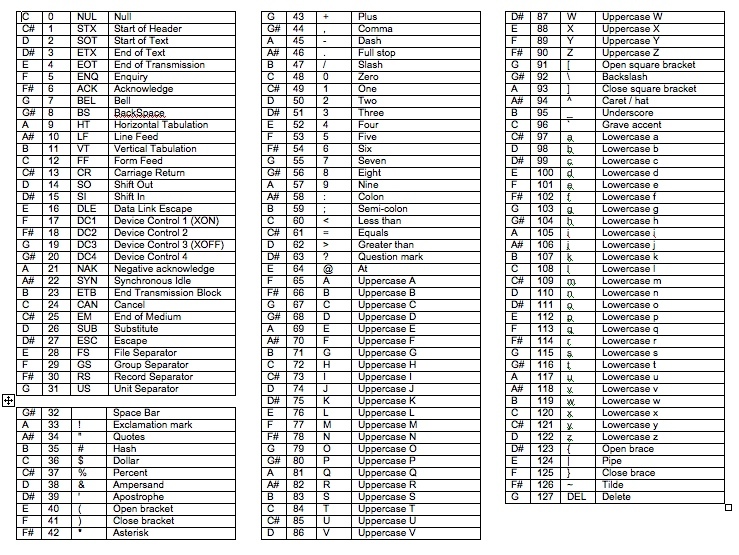 All these functions are available in Pure Data. ‘/ 2’ means ‘divide-by-2’; ‘mtof’ means ‘convert MIDI note to frequency’; ‘osc~’ is an oscillator; and ‘dac’, the digital-to-analogue converter sends audio out to the computer’s sound system. The number 64 is is in a ‘number’ box – it doesn’t do anything, it just tells you what MIDI note is passing from ‘/ 2’ to ‘mtof’. Useful if you want to check what’s going on. 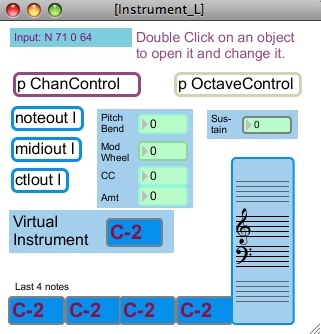 This program works – I’ve just tested it (but don’t forget to turn ‘audio ON’ from the ‘Media’ menu of Pure Data) – but the problem is that the travel on a gamepad joystick is not that far, and you don’t want to go from the lowest MIDI note possible to the highest in such a short space. So a lot of what I had to do was to restrict the range of notes available. In the end, as you’ll be able to see in the finished patch, I did this by dividing again by 10, severely restricting the range of notes available to the joystick at any one time; and then using one of the buttons as a freeze-pitch button, with a very short time-delay to allow the joystick to spring back to the middle. In this way it’s possible to play a few notes, ending higher or lower than where you started, freeze the pitch there, let the joystick go back to the middle at this new pitch, and gradually move up and down in steps, as required. After a little practice, this came to seem quite natural. 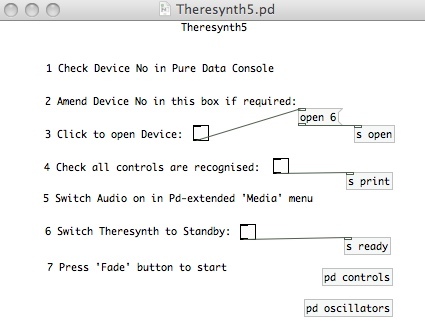 Following these steps gets the Theresynth ready to use. Steps 1 – 4 just operate the checks I described above: identifying the device number, checking the buttons are all recognised by the program, opening the device and switching on ‘hid’. Step 5 reminds me to turn the audio on – although in later programs I found out how to do this automatically when the program loads. Step 6 may or may not be necessary, but clicks some toggle switches on and off to guarantee everything is ready to work, but stays silent. Step 7 turns up the volume and you hear the initial tone, which is A (440Hz). 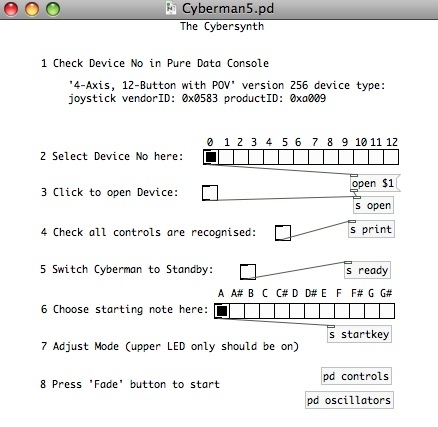 The actual programming is visible in two windows, ‘controls’ and ‘oscillators’, which can be opened by clicking the boxes in the bottom right. In my next post, I’ll describe how I improved this design, but the instrument definitely worked, and seemed to me to be a good use for a second-hand joystick. In the course of creating alternative keyboards, and interpreting USB inputs, I had an idea for a project which could prove to be useful. It occurred to me that the computer was able to recognise the input from QWERTY keyboards because of the chips and circuits inside the body of the keyboard – the actual switches themselves, how they were laid out, what exactly they represented, were irrelevant. So, if you had access to the circuit board inside the keyboard, and left the USB connection intact, you could do what you liked with the switch connections. 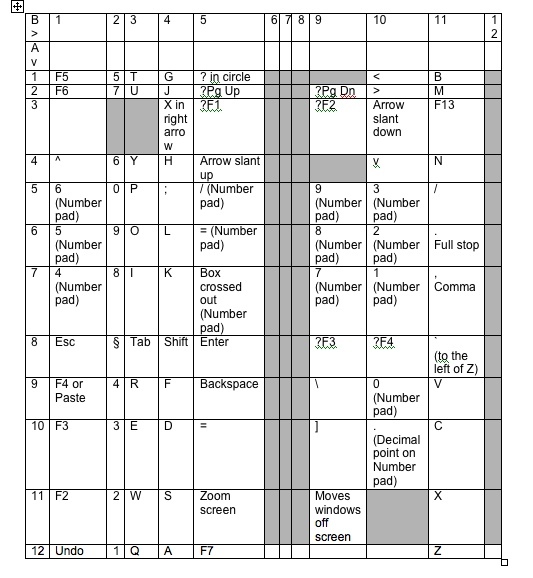 The keys of a QWERTY keyboard are arranged in a matrix – I had no idea how many connections there would be in each axis, and it probably differs from one model of keyboard to another. But I had an old Apple keyboard I was about to throw out because of sticky keys, and I decided to experiment on this. First of all, I took it apart, threw away the casing, put the switches to one side, and detached everything from the circuit board, except the USB lead. As it happens, the circuit board in this keyboard is unusually large – covering the whole width of the keyboard, and with extra USB sockets on each end. Normally, the mouse would be plugged into one of them – and they aren’t the same: the one with the lead attached is the one that has to be connected to the computer. The extra USB connectors on the ends of the board would probably be useful later, but more important was the circuit board itself. 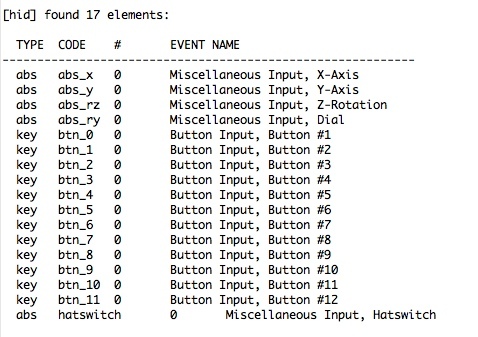 Here you could see the two series of tracks for the two different axes of the switch matrix. In theory, each track in the first series – which I called Series A – would give a different output when connected to each track in the second series – Series B. There was only one way to find out: I plugged the USB lead in to the computer, opened Word, and got to work with a lead and crocodile clips. If I remember correctly, I had to scratch off the track surface a little to get a good contact, but starting on the left I clipped the lead to the first track, A1, and progressively touched the other end to B1, B2, and so on, noting in a table what letters or symbols appeared. 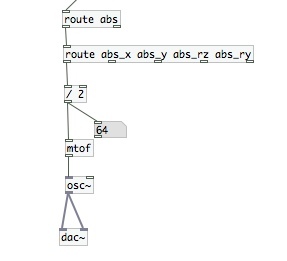 When I reached the end of the Series B tracks, I reattached the lead to the second track on the left, A2, and repeated the procedure, touching each of the tracks in Series B and noting the results. This list seemed to contain all the letters of the alphabet and all the numbers 0-9, so I considered this a great success! It seemed to me that tracks 1, 2, 4, 5, 6, 7, 9, 10, 11 and 12 in Series A, and tracks 2, 3, 4 and 11 would be the useful ones – 14 connections giving 40 outputs. 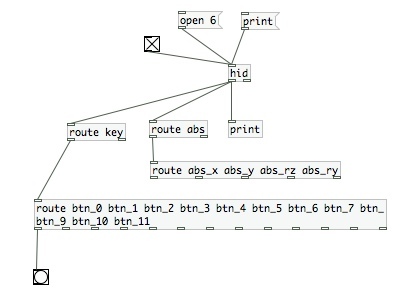 It wouldn’t matter what kind of switches were used to make the connections, their output would be predictable and the ASCII codes they produced could be interpreted reliably by programs such as Pure Data. 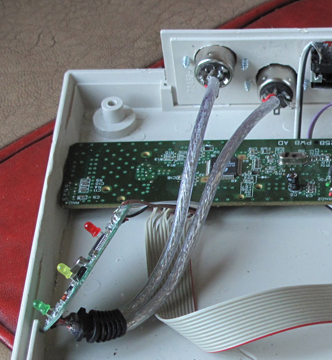 You can see the leads from Series A on the left-hand side and the leads from Series B on the right-hand side, leading to a circuit board with PCB connectors. These are connected to 3 different sockets on the back of the box. There are 3 sockets because I decided that not every potential application would require the full 40 connections. There’s a 15 way DB15 HD socket (the type used for VGA) for any application requiring the full 14 connections (10 x 4 matrix covering all the letters A – Z, numbers 0 – 9, and a couple of others); a DB9 socket for applications requiring only 7 or 8 connections (4 x 3 or 4 x 4 matrix, e.g. a numeric keypad); and a 4-pin socket (the type used for S-Video) for an application requiring only 4 connections in a 2 x 2 matrix. The original circuit board, as described above, had a hard-wired USB out lead and a USB A socket on each end. As you can see from the above pictures, I took off the hard-wired output lead and replaced it with one of the sockets from one end of the board. I know you’re supposed to have USB B, not USB A sockets in this position, but it’s easier to come across USB A to USB A leads, and the functioning is still the same. The large DB25 socket, and the two 5-pin MIDI sockets on the left are for a future project, not yet finished, for a fully-featured MIDI controller. I’ll describe this in a later post, when I get round to constructing it. I also bought a supply of leads, ready for when external switching devices need to be attached. In some cases this was easier than others. I chose these formats partly for the availability and inexpensiveness of the leads, but was unaware that the 15-pin HD leads commonly seen are designed for VGA or S-VGA, which don’t have all 15 pins connected one-to-one. In the end I found the ones I needed, but if you’re doing the same kind of thing, take care. Although not strictly necessary at this stage, I decided to add this feature while I was working on the box. The MIDI controller, planned to be in the same enclosure, would need a USB converter in order to be attached to the computer. The only USB converter I have at the moment might be required in future for another device, so I decided to add a MIDI to USB converter to this box, which the MIDI controller could use if necessary. I took a chance on a cheap MIDI converter, which was £5 on Amazon. 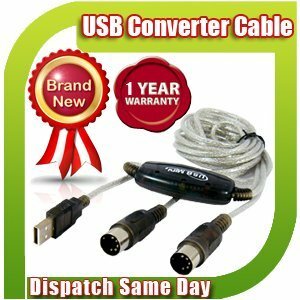 I had read bad reports of these things, but they’re so cheap compared to the brand name converters, I thought I’d see what they were like. You can get them for even less than £5, direct from China. When I got this one, I took the circuit board out of its plastic casing, chopped off the the in/out leads and rewired them to the sockets on the back of the project box. It was powered via USB, and appeared to work fine with my Sonuus G2M Guitar to MIDI converter, so I took the final step of cutting off the USB lead and attaching the USB output to the spare USB input on the Apple keyboard PCB. (It was spare because, as mentioned above, I took the socket off to create a new USB output socket instead of the hard-wired lead). It still worked, so I put the lid back on the box, and called it a day on that project for the time being. When I get round to creating some alternative switching devices, or start on the MIDI controller, I’ll post something on them. A brand of keyboard with a smaller PCB would probably be more practical, and any keyboard will do, if you want to try it yourself. There’s an excellent video on YouTube, here: www.youtube.com/watch?v=a3NxQ60E72k, which goes through the steps very clearly. It just so happens that I saw a job lot of broken Apple keyboards for sale like the one I used here and bought them for about £1 each, so I’m stuck with these for future experimentation! The faults they had were various – sometimes it seemed to be the circuit boards, sometimes it was just the odd key, so all of them looked usable in one way or another. I may not need the circuit boards – although I could make self-contained instruments if the cases were big enough to hold them – but I have plans for the keying mechanisms, which could be interesting.